Victoria and key crew members Matt Metzgar (Technical Director), Richard Reta (video design) and Robin Paterson (light design), along with actress Kitty Mei-Mei Chen rolled into San Francisco at 9:30 at night and headed to Portsmouth Square to check out the park at night. There we met Ernie from Somarts and Erich, our sound technician. After scoping out the site, we took Kitty to her hotel and checked into the hostel where we discovered a sign that said WELCOME DIRECT ARTS, complete with photos of Direct Arts A-Go-Go. Victoria passed out but Matt, Richard and Robin went to get a nightcap an Irish pub nearby. The next day, Cristian met us with his van at the hostel at 9AM and we went off to get lights and sound equipment. Since the van used to transport prisoners to work detail, there was no handle to the back door and Victoria and Erich, who were sitting in the back, couldn't get out by themselves. Erich mused that if there was an accident, they'd be toast. The Somarts warehouse, where we had tech, is in an industrial neighborhood full of beautiful old abandoned warehouses. Victoria wanted to create a theater district out of all the empty buildings. We had lunch at a great Mexican place as the cast arrived and settled into the hostel. But with a few unanticipated needs, the crew was still working when we had to leave for Taishan Cafe at 4PM. Victoria and Matt left with the promise to bring back plenty of food. 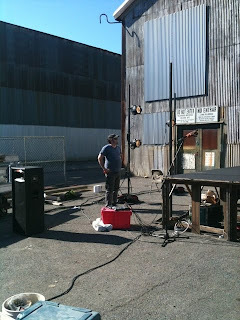 Robin Paterson at Somarts warehouse load-in. 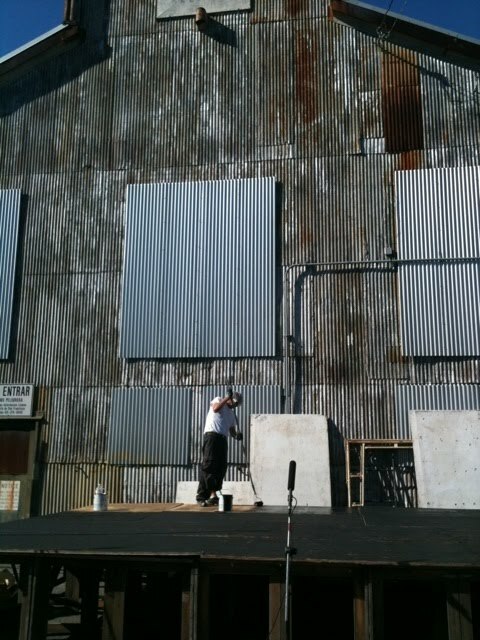 Richard Reta painting the stage at Somarts warehouse. Taishan Cafe turned out to be clear on the other side of town. 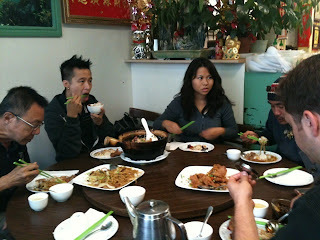 We arrived to find Genny Lim and half the cast there. 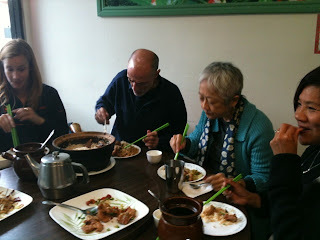 The meal was fabulous country style Taishan food, with a highlight being rice in a clay pot. But since Cristian wasn't there with us, we waited for Dan to arrive from the school where he teaches for an extra vehicle to transport all twelve actors to the warehouse. It turned out Dan had a pickup with a cab. Victoria went with Max, Hansel, Avery and Carl in the back of the pickup, while the other actors got a cushier ride with Genny and Max. A definite highlight of the pickup truck ride was stopping at a light and seeing a couple heavily making out in a car behind us. The scene at the back of Dan's pickup. We arrived at the warehouse and set up an actors area but since it was so cold, we decided to do a cue to cue rather than run through the whole play. Genny had left us a blanket that we made great use of. Matt made a run for tea and coffee to warm everyone up. At the end of six hours working out lights and video projections, everyone was dead tired. Everyone bundled up for the tech. Helen Kim & Max huddled under the blanket.